TOI Fresh is the portable restroom for more comfort, better functionality and modern design. Our TOI Fresh is just the restroom for the very demanding. The white color of TOI Fresh is indicative of the service quality and creates a feeling of space when you are inside it. 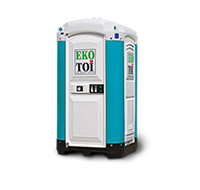 Thanks to the factory-built lifting loops on the roof, this toilet cabin is suitable for placement on upper floors and at inaccessible places. TOI Fresh is also available in red color.